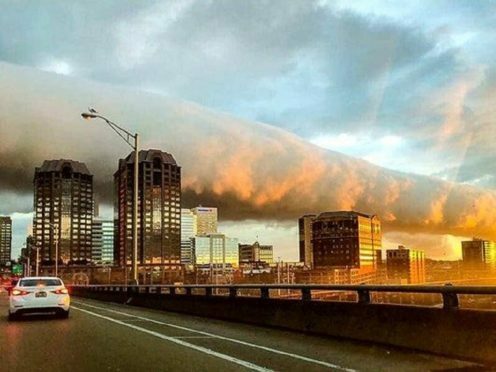 Social media users have captured the incredible moment an apocalyptic-looking “roll cloud” billowed over the American town of Richmond, in Virginia. The cloud came over the sky at sunrise, and people close by were treated to the beautiful natural event at rush hour. Instagram user Jeremiah Zabal captured the amazing moment the cloud hit, speeding up the footage so it appeared the cloud was creeping across the horizon. Roll clouds, or arcus clouds, are associated with storms and form within warm air from near the ground which has been pushed up by the cold air exiting from the storm clouds. 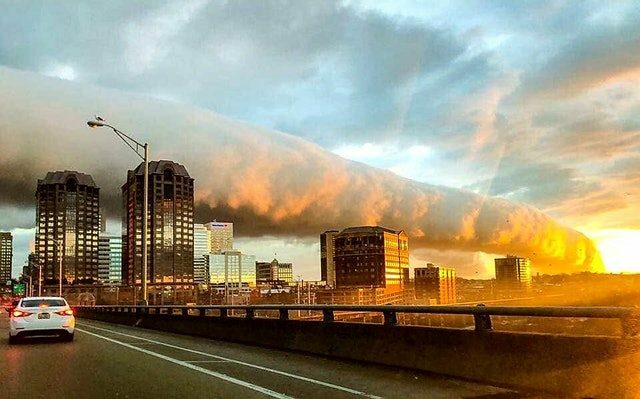 The special thing about this roll cloud, however, is that it took place at sunrise, which meant the normally ominous-looking cloud cast a beautiful, gold glow over the city. A photo by Dan Holler on Instagram captures the rare event. An enormous #rollcloud over #rva at #sunrise this morning. If you’re hoping to spot a roll cloud yourself though, you might be waiting a long time, as they are very rare, and unlikely to coincide with the sunrise, as this one did. One of the most famous frequent occurrences happens in Queensland, Australia, which can occur up to four out of 10 days in October. Thankfully, savvy residents of Virginia took plenty of photos for us to marvel at. This picture by Joseph Moore shows the moment the cloud appeared over the city skyline.